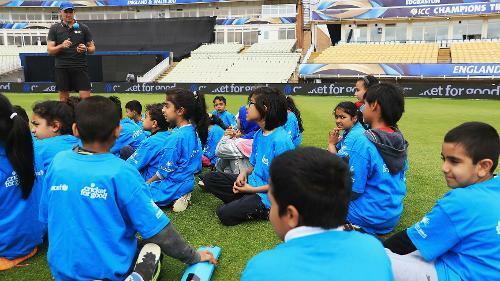 Mike Hussey interacts with children at the Cricket For Good coaching session in Birmingham. Mike Hussey looks on as a girl practices her drive during the Cricket For Good coaching clinic at Birmingham. Mike Hussey exhibits the proper driving technique at the Cricket For Good coaching clinic at Birmingham. Children look on as Mike Hussey throws a ball at the Cricket For Good coaching clinic at Birmingham. 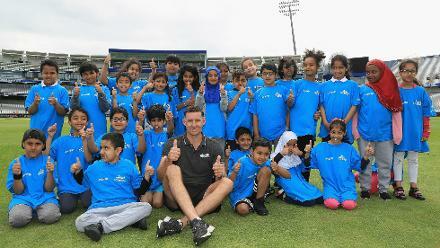 Mike Hussey poses for a picture with local children at the Cricket For Good coaching clinic at Birmingham. Local children practice fielding skills at the Cricket For Good coaching clinic at Birmingham. 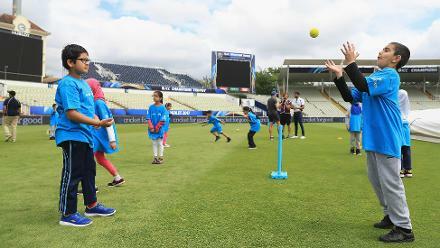 A local girl practices a shot at the Cricket For Good coaching clinic at Birmingham. Mike Hussey oversees a girl practising a shot at the Cricket For Good coaching clinic at Birmingham.